ReTrans Freight provides FEDA members and suppliers with a proven way to save money on LTL, Truckload, Intermodal, Expedited, and International freight expenditures. 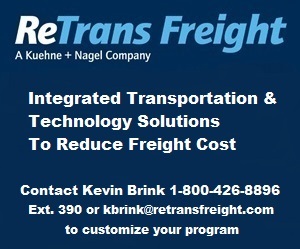 As an enterprise freight management firm, ReTrans Freight provides much more than freight pricing options. We touch and benefit every area of FEDA members' and suppliers' business and have been doing so through FEDA for decades. Rate quotes and carrier options can be linked directly into AutoQuotes as well as order processing and e-commerce systems. Freight rates are frozen for the entire calendar year, protecting your bids from potential profit loss stemming from open market rate increases and fuel surcharges. Our vendor freight routing portal, which facilitates interactions between you and your freight vendors, streamlines shipment orders and ensures accuracy and timeliness of billing. ReTrans Freight's technology can be accessed through the web or via our XML and EDI interface which links directly to your software systems and supports AutoQuotes. This process eliminates the manual chore of entering information associated with checking rates and assigning GL codes into the system. Our streamlined process surrounding the administration of billing removes manual inputs, reduces costs, improves accuracy, and creates a closed loop accounting system with single check payables. Customized reporting allows you to review your freight history in a variety of meaningful ways, giving you the information you need to make strategic business decisions. Our streamlined process surrounding the administration of billing removes manual inputs, reduces costs, improves accuracy, and creates a closed loop accounting system with single check payables. Customized reporting allows you to review your freight history in a variety of meaningful ways, giving you the information you need to make strategic business decisions.